Another week, another Week In Review! Hostessed by Meghan at Clean Eats, Fast Feets, you get to know more than you ever wanted to know about my week. Well, maybe not quite that much, but you know how it can be!! So what went on this week? ~I wrote my morning pages every day as instructed by The Artist’s Way. They are becoming a very important and useful part of my routine. I can write things down that are annoying me and also things that are making me happy. Either way, I write it so that I’ll either remember it or get it out of my system. I’ve also started another practice that Julia Cameron suggests called Counting. It’s simply tracking everything that you spend. It helps you to be more aware of where you spend your money and helps you to get a feel for where you may be spending fruitlessly. I wasn’t perfect at this last week, but I’m going to try to do it regularly from now on. Speaking of money, I continue with my contributions to my Money Jar that I started the first week of the year. First week you put in $1, second week $2 and so on. Just put in this week’s contribution and I have $36 in there already. I like it and I’ll continue. Can’t wait to have all that money at the end of the year. ~I wrote three blog posts. I still didn’t get that fourth one back in there. I’ve got to work on that. I think I’ve come up with another link up I’d like to join and that will show up this week. In any event, I’m happy with what I’ve been doing and I’ve been feeling back on track with it. ~Basic life things: Got my hair cut, I colored my hair (Yes, I am a natural beauty in spite of that!) and I had blood tests done. I don’t like being stuck with a needle. Funny thing is when I used to work at the hospital, I would give blood every time they had a blood drive. It Never bothered me. Now, the thought of it makes me cringe. I get regular phone calls from the Red Cross asking me to donate at a local spot. I keep saying no. In fact, I got a call during the past week and I asked them to take me off of their list. When the man asked if I could give him a reason, I just said it was personal. Hopefully, the Red Cross doesn’t read BCDC!! ~We celebrated Valentine’s Day with breakfast at the diner on Friday. Here is my Valentine’s gift. 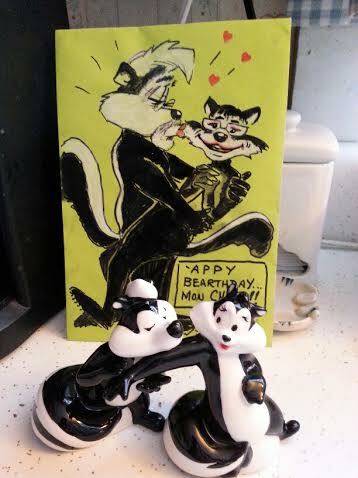 The valentine gift is the little statue in the front which is actual magnetic salt and pepper shakers of Pepe Le Pew and his girlfriend whose name I believe was Fleur. Ralph found these and it’s so funny that they match the drawing he did for me on my birthday card. I had to show them together. I was very excited! ~Regarding Weight Watchers, this was not a good week. Let’s just say I had a gain and that the weekend, was not great either. However, today is a new day! I will be tracking, I will be planning ahead and I will be in control, the food will NOT be in control. I made a big crock pot of the Weight Watchers veggie soup yesterday so that will give me a good start for the week. So, the sun is shining! Amazing way to start the week. I need some sun. I’m tempted, in spite of the cold to just go outside and sit in the sun. I may just do that! Be sure to check over at Clean Eats, Fast Feets to see what the other Reviewers have been doing all week. This entry was posted in Uncategorized and tagged crock pot, Week In Review, Weight Watchers. Bookmark the permalink. It sounds like you are starting the week off on the right foot (WW soup) and with the right attitude. I like it. Great job Fran. I need to check out the Artist’s Way stuff I have and see what it’s all about. Ralph’s gift is adorable and Pepe’s girlfriend was indeed Fleur. I’m hoping for a good week, Meghan! Gotta get back on WW track. So far so good. Have a great day! Glad I was right about Fleur! Oh I like your Money Jar idea! Alex and I have been doing a lot of budgeting before the wedding coming up! I’m sure you have lots of budgeting things to work out. But working together, you can do it. I’m so excited for you both. Can’t wait to hear more details! Thanks, Sarah, I thought that the gift was adorable too. Have a great day!